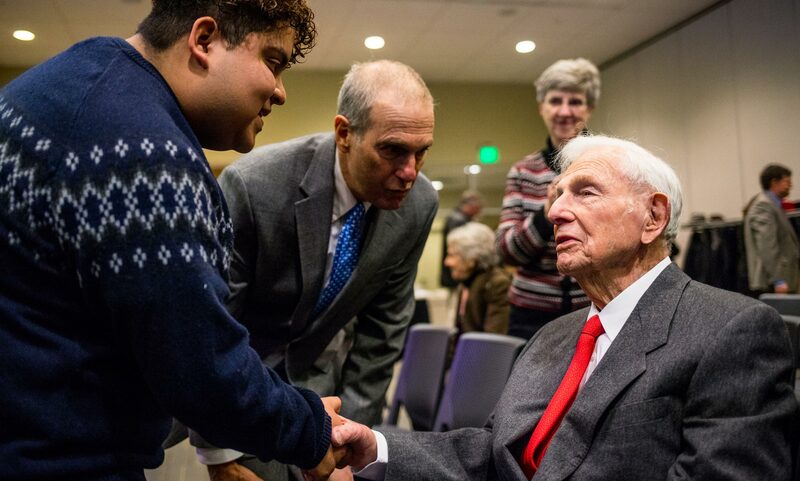 UMKC student Brian Ramirez greets Henry Bloch and his son Tom (pictured in the background) at the scholarship announcement event. About 800 students will benefit over the next nine years from a new $20-million scholarship program established by the University of Missouri-Kansas City, the Marion and Henry Bloch Family Foundation, the H & R Block Foundation and the University of Missouri System. Under the program announced today, the two Foundations will provide $10 million to be matched by a combined $10 million from UMKC and two UM System scholarship programs: the Promise and Opportunity Scholarships program, and the Next Generation Merit Program. This represents the second $20-million scholarship initiative announced at UMKC in the last three months. In November 2018, the university announced a similar $20-million scholarship initiative in partnership with KC Scholars. The new scholarship program – named the Bloch Family Scholarships – expands one existing UMKC scholarship program and adds two new ones. All three programs will launch in Fall Semester 2019. The Henry W. Bloch/UMKC Promise and Opportunity Scholars program expands the existing Henry W. Bloch Scholars program to serve approximately 200 students; currently 47 students are enrolled in the program. The program targets promising students from urban neighborhoods who would not be considered for traditional scholarship programs due to past academic performance or life circumstances. The program had been limited to low-income students starting their college careers at either Donnelly College or Metropolitan Community College-Penn Valley Campus, and then transferring to UMKC to complete a bachelor’s degree. The newly expanded program will serve about 100 high-need students in the transfer program plus about another 100 high-need students enrolling at UMKC as first-time freshmen. The program is budgeted at a total cost of $6.4 million ($2 million to be funded by the Bloch Family Foundation and $1.2 million from the H & R Block Foundation). This new Marion H. Bloch/UMKC Next Generation Merit Scholars program is designed to attract, encourage and support underserved, high performing students living in urban environments in greater Kansas City. This signature program complements the Henry W. Bloch Scholars. The program is expected to serve more than 100 students at a total scholarship cost of $4 million ($2 million to be funded by the Bloch Family Foundation). The Bloch Launchpad Scholars program is designed to attract highly qualified undergraduate students to the Bloch School of Management who are motivated to integrate academic and professional development experiences. Because of UMKC’s positioning in Kansas City, the program will provide distinctive opportunities for students to combine academic coursework and on-campus engagement with internships, service learning, mentoring programs, and other career-related experiences. This program provides a unique opportunity for the Bloch School and UMKC to partner with organizations throughout greater Kansas City to develop talent for the region and provide outstanding educational experiences for students. Launchpad Scholarships require a commitment to engaging in professional development activities, with award levels varying with academic performance. While the total number served by this program will depend on the mix of award winners and may vary by year, it is anticipated that approximately 500 students will be served at a total cost of $9.6 million ($4.8 million to be funded by the Bloch Family Foundation).